Polymeric Sand Vs. EnviroSAND for Pavers | Envirobond Products Corp.
Are you considering polymeric sand for pavers? While the use of polymeric sand with pavers is quite popular, there are some serious implications you’ll need to consider. 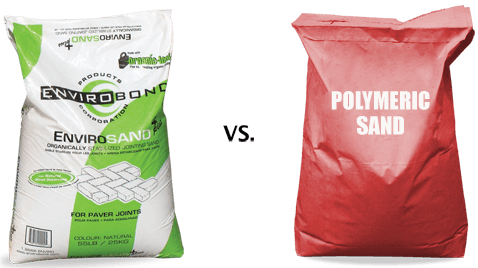 Understanding the differences between using polymeric sand vs. EnviroSAND is an important step in your decision-making process. You’ll need to think about certain environmental considerations, ease of maintenance and weed deterrence. One of the disadvantages of using polymeric sand is the chemicals that go into making the product. Polymeric sand relies on a chemical reaction to harden it into the joints between your paving stones. Once it hardens, it is permanent. Unfortunately this also is true for the polyhaze that often appears on the surface of your paving stones. Any excess product remaining on the surface of the stones after installation will form a visible layer that can be almost impossible to remove. When using EnviroSAND, this problem simply doesn’t exist. If some of the organic binder in the product is left on the surface after installation, it can. be removed by re-hydrating the area and scrubbing the binder from the surface of the stones with a stiff non-metallic brush. The decision to use polymeric sand vs. EnviroSAND for pavers also means considering long-term maintenance requirements. Polymeric sand can deteriorate quite quickly since is forms a monolithic, non-flexible mass. Cracking can occur in the joints as a result of seasonal changes because of this inflexibility. Large amounts of rainfall can cause washouts. The only solution would be to completely remove the polymeric sand redo the whole pathway. EnviroSAND is flexible so cracking doesn’t occur in the joints. Its organic binder, Organic-Lock, is water-permeable and forms a gel as it absorbs water during rainfall. This gel effect helps keep the sand particles in place and resist washing out. And its self-healing nature means that it can be topped up seamlessly every few years if needed. The decision to using polymeric sand vs. EnviroSAND for pavers is further defined by the level of weed deference they offer. As a result of polymeric sand’s monolithic properties, cracks can easily occur. Once there are cracks, weeds can start to grow in them and your project will quickly become unsightly. The ingredients in EnviroSAND’s organic binder deter weed growth and keep your project looking beautiful for years to come. If you want to make the best decisions when planning your hardscaping projects, then carefully consider the materials that you’ll be using before installing them. Choosing the right options will allow you to enjoy lower maintenance and a longer lasting pathway or patio. Envirobond is now available for the DIY pathway at Canada’s Home Depot!